First unveiled at the 2010 Hanover show, followed by the 'Maxi' version which was introduced at the 2011 Geneva Motor Show, Kangoo Van Z.E. arrives in UK Renault showrooms in November. It is targeted at business customers looking for an economical van that is more respectful of the environment. Kangoo Van Z.E. is the market's first affordable, all-electric van. Available in two- and-five-seat Maxi versions, too, it carries over the same user-friendly functional features as the internal combustion-engined version with a carrying capacity ranging from 2.4 to 4.6m3, a payload of 650kg and the same level of comfort. Kangoo Van Z.E. also offers a silent, versatile driving experience with maximum torque available from start-up, seamless acceleration thanks to the absence of gear changes, low running costs and, naturally, the satisfaction of motoring with zero tailpipe emissions in use. Renault produces Kangoo Van Z.E. on the same production line as the internal combustion-engined model at its M.C.A. (Maubeuge Construction Automobile) factory in northern France. It benefits from the same know-how, supplier base and logistics network as the current Kangoo. The Maubeuge factory has specialised in manufacturing commercial vehicles for the past 20 years, and is constantly adapting to the varied demands of this kind of vehicle (short- and long-wheelbase versions, panel vans or glazed, etc. ), as well as to market demand. This decision ensures the vehicle can be put into production rapidly while ensuring a very high standard of quality. Thanks to the central location of the battery, below the floor, Kangoo Van Z.E. features the same dimensions and carrying capacity as the internal combustion-engined model. With an overall length of 4.21m, the load volume ranges from 3m3 to 3.5m3, while payload is 650kg. The flat floor permits a maximum load length of 2.5m (with passenger seat folded flat) which is identical to that boasted by the internal combustion-engined version. The width between the wheel arches is 1.21m, which enables a euro pallet to be loaded. The asymmetric rear doors, plus the sliding side door, enable easy access to the load area. Kangoo Van Z.E. is a versatile vehicle and is available in two- and five-seat 'Maxi' form. The wheelbase of Maxi versions has been extended by 40cm for an overall length of 4.6m. A carrying capacity of up to 4.6m3, an additional 1.1m3compared to Kangoo Van Z.E. A maximum load length of 2.9m. In its five-seat configuration, Kangoo Maxi Z.E. features a 60/40-split folding rear bench seat. It can carry up to five people and includes a load carrying capacity of 2.4m3. Seating in this versatile vehicle can be arranged in up to four different ways according to the number of people being carried. The bench seat can also be folded into the floor to provide an all-flat surface and free up extra space for a carrying capacity of 3.6m3. Kangoo Van Z.E. is available in a choice of nine standard body colours, although customers are able specify their own company colours. The dashboard has been entirely rethought to make range optimisation easy and efficient. A gauge which indicates the battery's level of charge. An econometer which tells the driver how energy is being used: light blue indicates the vehicle is running 'normally', dark blue is optimum while red indicates that energy is being used excessively in a way that will impact the range. The on-board computer has been tailored to meet the needs of driving an electric vehicle. It indicates the remaining range in kilometres, the battery's remaining capacity in kWh and the average and instantaneous energy consumption. Finally, the speedometer features a 'Z.E.' colour scheme, with the figures highlighted on a turquoise blue semi-circular background. The electric motor is powered by a 22kWh lithium-ion battery which provides an NEDC (New European Driving Cycle) combined cycle range of 170km (106 miles). This range meets the majority of business customers' everyday driving needs. Indeed, Renault's research indicates that 70 percent of van drivers cover a daily distance of less than 62 miles. In real-world conditions, the operational range of electric vehicles varies more than that of an internal combustion-engined vehicle and depends on factors like speed, the lie of the land, use of the climate control system or heater, the outside temperature, driving style (sporty, normal or 'eco-driving'), etc. Unlike internal combustion-engined vehicles, electric vehicles are at their most energy-efficient in built-up areas in heavy traffic, when a range of 125 miles can be achieved. When the vehicle is at a standstill (red lights, heavy traffic, etc. ), the electric motor doesn't use any energy, while the system that recovers energy under deceleration, works more frequently during city motoring because of repeated braking and stoping. In contrast, severe weather conditions coupled with sporty driving, hilly routes and no use of the pre-heating system, can reduce the vehicle's range to around 50 miles. Batterycharging under deceleration: when the driver's foot lifts from the throttle pedal, the vehicle's kinetic energy is recovered by the motor, which converts it into electric current which charges the battery. This system induces more pronounced engine braking, which triggers the brake lights. After a short while, the driver will realise that he or she hardly needs to use the brakes. An Eco Mode function is fitted to Kangoo Van Z.E. as standard. Activating this button restricts the motor's performance (torque and speed) and enables gains in range of up to 10%. The Eco mode can be overridden by fully depressing the accelerator pedal. The vehicle is equipped with a pre-start system. When the vehicle is plugged in, it is possible to programme the pre-heating or pre-cooling of the vehicle cabin. This function offers comfortable temperatures as soon as the driver gets into the vehicle and the system has no impact on range. An additional 5kW heater is available as an option to heat the cabin while preserving battery life. This heater uses B30 or diesel fuel and requires the 13-litre fuel tank to be filled. The filler cap is located in the same place as it is on the internal combustion-engined vehicle. This option has been included especially for markets which experience extreme cold conditions. Kangoo Van Z.E. is the market's first affordable all-electric van priced from £16,990 excluding VAT. The long wheelbase Kangoo Van Maxi Z.E. is £17,990 excluding VAT with the five-seat crew van version at £18,690 excluding VAT. Renault rewards customers who reserved their Kangoo Van Z.E. via www.renault-ze.com with a preferential hire rate reduction of £3 per month compared to the rates shown in the table above, including roadside assistance. No requirement for a battery hire contract with a third party. It is a Renault offer through its subsidiary RCI Financial Services. The contract guarantees the battery will work well and have a good level of charge. The customer doesn't have to bear the potential financial risk associated with a malfunctioning battery. Should the vehicle be sold on, hiring the battery is a clear advantage, since it doesn't have any impact on overall residual value. The electric motor offers an extremely high energy-efficiency of 90 percent, which is significantly more than that of an internal combustion-engine (25 percent in the case of a petrol engine). This means that when 10kWh of energy is consumed, 9kWh are transmitted to the road in the case of an electric vehicle (compared to 2.5kWh in the case of an internal combustion-engined vehicle). Meanwhile, energy efficiency is further enhanced by low rolling resistance tyres. Energy costs vary significantly from market to market but are always more favourable for electricity than fossil fuels. The cost of electricity per mile is between five and ten times lower than petrol. The further you go, the bigger the economic advantage of the electric vehicle. The maintenance costs of an electric vehicle are 20 percent lower than those of an internal combustion-engined vehicle. For example, there is no timing belt, air filter or fuel filer that needs to be replaced, and no oil changes are required. Where can you buy and service Kangoo Van Z.E.? 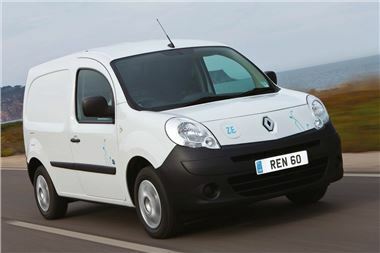 Renault UK has appointed a network of 20 Z.E. Expert Dealers who have invested in specialist tooling, training for both sales and workshop staff and showroom display. This includes accreditation to a European standard for electrical safety from both the IMI and Lloyds Register. In addition these Z.E. Dealers will have a demonstrator for each model in the Z.E. range. The whole Renault network will have a role to play in handling initial enquires and being able to carry out non-specialist maintenance operations. In the Z.E. Dealership, customers will receive a comprehensive explanation of the electric vehicle technology. During handover of the vehicle, the technician starts the Z.E. services. In order to help you familiarise the driver with their new car, tutorials are available on the internet. Finally, a Customer Relations Freephone Hotline has been established for any questions you they have and, from November 2011, owners will also be able to chat to Customer Relations direct from the Renault UK Z.E website. As Kangoo Van Z.E. will be the first product launched in the UK, the backbone of the Z.E. Dealer network will be Renault Pro+ centres, which are tailored to meet the needs of business customers. These centres will include a dedicated work shop to repair electric vehicles. More than 250 Pro+ centres will be operational across Europe by the end of 2011, of which 23 are in the UK.